The beauty of living on Long Island is the fact there’s access to a variety of types of year-round water sport and leisure activities from boating, surfing and swimming to kayaking, canoeing and stand-up paddleboarding (SUP). In particular, many Long Islanders have not only taken to the local lakes, rivers, bays, and oceans with their kayaks and canoes but also more recently with their SUPs. They’ve found kayaking, canoeing and stand-up paddleboarding to be a fun and relaxing way to explore the great outdoors. Beyond the enjoyable and meditative nature of these outdoor water activities, they’re also excellent low-impact exercises that can improve your strength, concentration, stamina, flexibility and overall fitness level. All three can increase your heart health without putting unnecessary wear and tear on your joints. In addition, the paddling motion and balance needed to properly propel these vessels tone your arm, back, chest and shoulder muscles and fortify your torso and legs. However, as with any leisure or sports activity on land or water, the risk of injury from kayaking, canoeing or SUPing still exists. 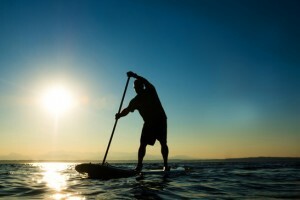 First and foremost, the best way to avoid injury while out on the water is proper paddling form. This includes not overextending your arms and maintaining what’s called a “power position,” which is when you consciously keep your hands in front of your shoulder line and don’t allow your hands to cross your midline. In turn, this results in a “paddler’s box,” which is a rectangle created with your arms, paddle, and chest. It keeps your shoulders in the safest position when paddling. It also promotes good posture when paddling, and helps you generate power using your torso and upper back instead of your arms. Keeping Your Body Aligned and Flexible: Making sure your spine and other bones and joints are in the correct position and moving properly without pain or stiffness protect against overuse problems and stiffness. Additionally, since motion is how your joints, discs, and cartilage stay healthy, more flexibility achieved through stretching, movement, and yoga equals healthier joints. Stretching to Warm Up and Cool Down: Experts agree light stretching before and after you hit the water ensures easy movement of your muscles and staves off muscle soreness. Incorporating Proper Nutrition: A proper diet maintains a healthy weight, protects your joints and builds strong muscles. Contacting Dr. Todd Goldman in Medford: Calling his office in Medford at (631) 447-2299 today to schedule an appointment will allow you to spend more time in your kayak and canoe and on your paddleboard. It will also help you improve your skills. Our Medford chiropractor follows evidenced-based procedures that start with diagnostic exams to assess your situation. They allow him to then prescribe chiropractic treatments for any musculoskeletal injury you’ve sustained as a result of competitive or casual paddlesports. Dr. Goldman can also get you started with a routine chiropractic regimen, which would involve conditioning and exercises to enhance speed, endurance and flexibility, manipulations to extend the range of motion and adjustments to strengthen balance and improve posture and alignment. Following these steps will go a long way in preventing injuries and effective pain management. Studies have shown regular chiropractic care help athletes recover more quickly and heal properly, reducing pain and diminishing inflammation, so they can get back on the water more quickly.